Québécoise painter Marcelle Ferron was a member of Les Automatistes, a group, led by Paul-Emile Borduas, that believed that painting should be a result of the abstract workings of the inner psyche released subconsciously. She became well known also for her stained glass pieces, which she learned in Quebec and pursued further while living in Paris from 1953 – 1966; the Metro station Champ-de-Mars in Montreal contains one of her windows. 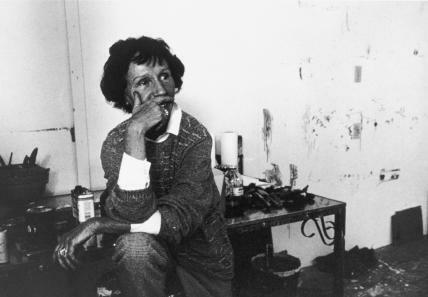 She was awarded the Paul-Émile-Borduas medal for the visual arts in 1983, and in 1985 was made a Knight of the National Order of Quebec. She was promoted to Grand Officer in 2000, one year before her death. In Toronto, Ingram Gallery will be exhibiting works by Ferron from March 19 – 9 April. Don’t miss this opportunity – the show comprises significant canvases from 1947 – 1997. Ferron was, we believe, a prolific artist. Her works come up regularly for auction in Toronto. Not all are of equal value, but the very good ones are truly superb. Thank you for sharing this. Her work is beautiful, certainly underrated. Regarding the A.J. Lloyd quote: Six woman signed the Refus Global… Magdeleine Arbour, Muriel Guilbault, Marcelle Ferron, Thérèse Leduc, Françoise Riopelle and Françoise Sullivan. The male signatories were: Paul-Émile Borduas, Fernand Leduc, Jean-Paul Riopelle, Marcel Barbeau, Bruno Cormier, Claude Gauvreau, Pierre Gauvreau, Jean-Paul Mousseau, Maurice Perron and Louis Renaud. I’m awaiting some clarification on this from AJ Lloyd. My apologies for the delayed response. Regarding the description of Ferron as “the only woman to sign the Réfus Global,” this should have in fact read: “the only woman painter to sign.” Indeed, Ferron was one of many women important to the movement/moment and my statement was in no way meant to lessen the contribution of these other women or celebrate Ferron at their expense. Thank you Adam, for pointing out this oversight! Don’t forget that Françoise Sullivan was also a visual artist. At the time of Refus global, she was concentrating on dance, and would become one of the major figures in modern Canadian dance, but she had studied visual art at the École des Beaux-arts and would return to sculpture in the fifties, concentrating on visual art until the present. After experiments in various directions (including conceptual art, producing some major works which she now tends to denigrate, and shouldn’t) she has returned to pure painting, producing sometimes monumental canvases mostly monochromatic in character. Last year, she won the Gershon Iskovitz prize, presented at the AGO. This information is not intended to distract, or detract, in any way from a celebration of Marcelle Ferron, who was a wonderful person and artist. I enjoy the tributes to our senior artists who have gone before us in Canada that you post. I ‘m not clear why the title Under Rated is the appropriate one. CELEBRATING would be a more appropriate term. The wonderful artists you post are part of the backbone of our cultural legacy, our art ancestors and besides many of them also are still living and active with their work…Thanks so much for your great art blog it truly educates us all…..
Just wanted to say how happy I am that a fellow artist sent me a link to this blog. I’m really enjoying what I’m seeing and reading so far! This is the first I’ve heard of Marcelle Ferron…she is incredible! (This is the thing about art work that was created in the moment …the artist’s spirit seems to linger around the image…perhaps bridging… that infinite gap.) Enough- thanks for this blog.